I thought I would start a new competition. 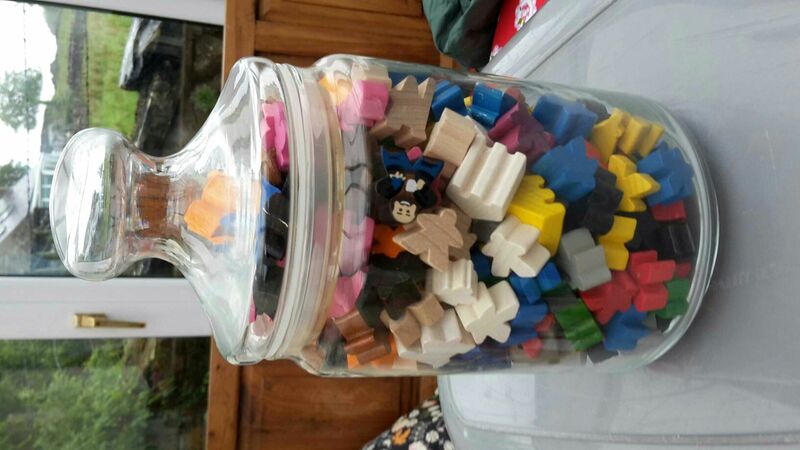 You must guess how many meeples of all shapes and sizes are in the jar. Simples! The first prize is a brand new copy of either German castles, German monasteries, or GQ11. There is a second prize of a copy of my fan expansion which has 2 new types of meeple and 4 tiles. Great idea (+1) - can I confirm that barns are considered meeple? Yes any kind of meeple, follower, etc - basically any sort of wood from carcassonne could be in there (possibly including fan expansions). But there are no bridges or tower pieces. This will run for about 2 weeks or so - maybe longer I will see how it is going! Nice . I'm going with 284. My guess is 200 wooden figures. I'll guess at 180 please. No, wait, 181 - I've just spotted a particularly handsome meeple that I hadn't considered in my calculations!